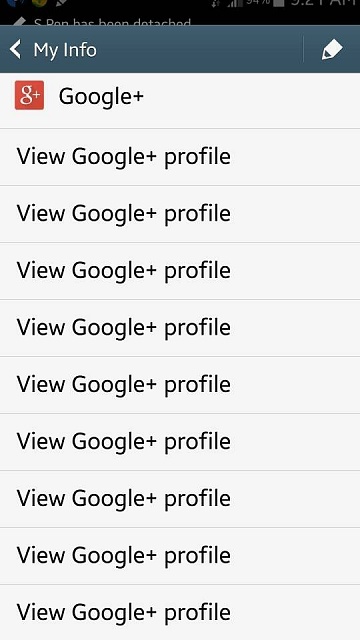 So I just noticed I have literally a 100+ G+ entries for myself in my contacts and similar for others in my contacts that also use G+. I really don't like this and haven't been able to figure out why this is happening or how to fix it. I'm not sure if it's a Note 3 issue or an Android issue. Can anyone offer some advice on how to clean this mess up? Oh and I cannot link my own for some reason. If you open Contacts, then hit the Menu Button, then Contacts To Display, the radio button next to Customized List, then the gear next to Customized List, you should be able to turn off the groups of ones you're not interested in. You can also try Contacts, Menu Button, Settings, and check "Only contacts with phones". As for editing, if you really want to delete them instead of hiding, it's a lot easier to do via a computer. Open Gmail on your computer, https://mail.google.com and then in the top left corner where you see the Google logo, below that it says Gmail and a downward facing arrow, click that, and choose Contacts, put a check next to any you want to delete, then click the More icon at the top center, and choose Delete Contacts. Then, back on the phone, open the phone's Settings, scroll down to Accounts, Google, your gmail address, UNcheck Contacts, UNcheck Google+, then REcheck Contacts, REcheck Google+, then at the bottom, click Sync Now. Thx gozira, I'll give that a try.